Legend Lighting Inc. is a full service lighting showroom serving Austin, Texas and surrounding areas. We are proud to be a locally owned and operated family business, and we strive to provide the highest level of customer service to each and every person who enters our showroom. On most days you will find one or several of us in the store, so please do not hesitate to let us know how we’re doing or if there’s anything we can do to assist you! Each member of our team, whether a member or our family or one of our knowledgeable lighting consultants, will work hard to help you find the right solutions for your needs. The lighting in your home should create an environment that is both comfortable and productive, and we’re committed to helping you achieve that balance. 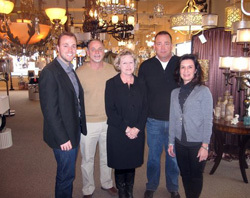 While our lighting showroom may be new to the Austin area, our family certainly isn’t! The Neals have proudly called the Austin area our home for 4 generations, and we think Austin’s a pretty special place to live and work. In fact, our background is in electrical contracting, and we’ve been providing quality residential electrical contracting services to Central Texas homebuilders for over 50 years! We feel that gives us a unique perspective in helping you with your lighting project. Legend Lighting is a licensed and insured electrical contractor, and working together with our sister company, PowerHouse Electrical Services, we are pleased to offer our customers turn-key installation services. This hassle free service means we deliver the lighting to your home and handle the installation safely and professionally at a very competitive rate. For more information about PowerHouse Electrical Services, please visit click here. Please call us or stop by our showroom so that we can help you with your next lighting project. We’d like to opportunity to earn your business. Our mission is to help you make informed decisions about lighting and find the right solution for your needs. We aim to provide the highest level of personalized customer service to every person who we work with.